Cómo se mantiene la superficie del hielo? WHY DOES IT NEED MAINTENANCE? - Skating produces snow with the friction of the skates. Tiny layers accumulate until they reach centimeters thick. This snow hinders skating and blurs the surface of the ice. Therefore, there are quantities of machinery, from very complex to the simplest and cheapest, but the objective remains always the same: remove snow and cover the skates produced by the skates by a very thin layer of water at temperatures higher than 80ºC so that the surface is even, smooth and without stripes. and most importantly, they do not allow to grow the ice sheet, which saves the work of the cold machinery. PROFESSIONAL ICE RINKS - For these cases, the ideal solution is to have a straightening machine, or "resurfacer", designed for large tracks, greater than 1500 m2. With electric and diesel models, the latter are only used on outside ice rinks. 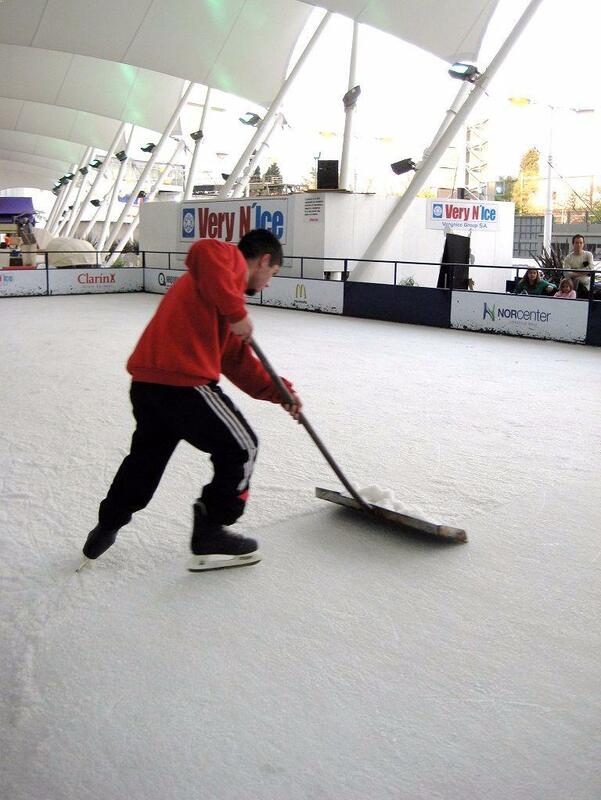 MEDIUM AND LARGE ICE RINKS - With dimensions greater than 600 m2 and up to 1500 m2, there are smaller and versatile resurfacers, with the ability to accumulate the snow produced by skating in a single pass. In general they also come with electric motor batteries, but for outdoor, with diesel engines. SMALL ICE RINKS - From 300 to 600 m2, there is small and versatile machinery, very maneuverable, which does an excellent job in a matter of minutes. VERY SMALL RINKS - For ice rinks less than 300 m2, the same work that a resurfacer does, can be done manually: the snow is removed with special blades, and then a very thin water is made to cover the scratches produced by the skates. WATCH OUT! - The edges of the ice rink should be cleaned with great care, because a bad job produces steps between the ice and the barriers, degrading the visual and detracting your ice rink. For these cases, there are also small machines that clean and mill the ice at the edges, leaving them perfect. 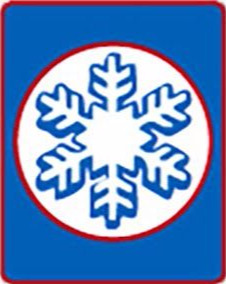 Very N'Ice works directly with the manufacturer in Italy - ENGO - which designs and produces high quality and affordable prices for all rink sizes. Do not hesitate to consult us for your particular case. The "engo minengo" electric edge milling machine has been developed for a professional, silent and low environmental impact work on the edges of the ice rinks in the kickplates of the perimeter barriers. 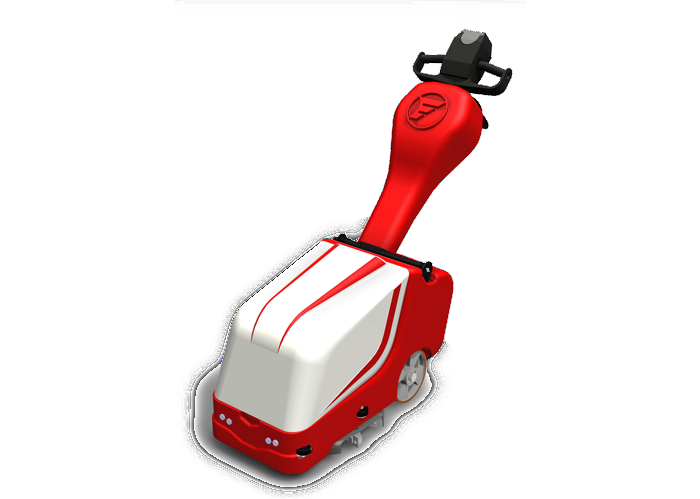 The machine is equipped with a height adjustable handlebar that adapts to the height, as well as a powerful 24 V - 2.0 KW electric motor with electromagnetic brakes with flange for immediate stop of the wheels of the cutter when the button is released. 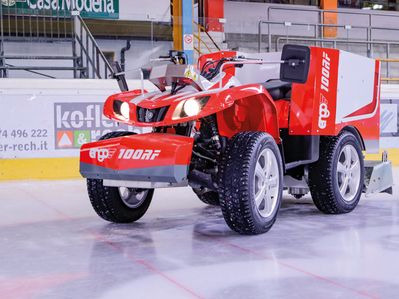 Engo 100 Red Fox is a small ice resurfacer machine with a basic equipment that concentrates only on basic needs. It offers what is essential to obtain the highest quality ice on the small rinks. The workstation is ergonomically designed, the control is easily accessible and easy to operate and is in the driver's field of vision. The driver can enjoy good reaction from the electrically connectable four-wheel drive, and good maneuverability. The combined snow / water tank is compact and made of stainless steel. The electric conveyors are powerful and silent. Thanks to an innovative technology of snow circulation, the ice straightening machine is very eco-friendly and environmentally friendly and saves a lot of water. Engo 170 SX is a medium ice smoothing machine for rinks up to 1000 m2, both indoors and outdoors. Engo Red Wolf "LX" is a fully equipped hi-tech electric ice resurfacer machine that covers every possible requirement. It has all the innovative assistants to conquer all the ice fields. The workstation is ergonomically designed, the proportional joystick and the 10.4 "high-resolution color touch screen are easily accessible and easy to operate and are in the driver's field of vision. Good reaction and good maneuverability of the engo machine and the necessary composure to master the situation at any time, it also includes the patented standard quick knife change system and the patented polisher increasing even more the safety of the driver during the handling of the machine Powerful and maintenance-free electric AC (alternating current) motors are reliable and quiet The ice resurfacer can also be equipped with numerous innovative features, thus making it a piece of personal and individual equipment. 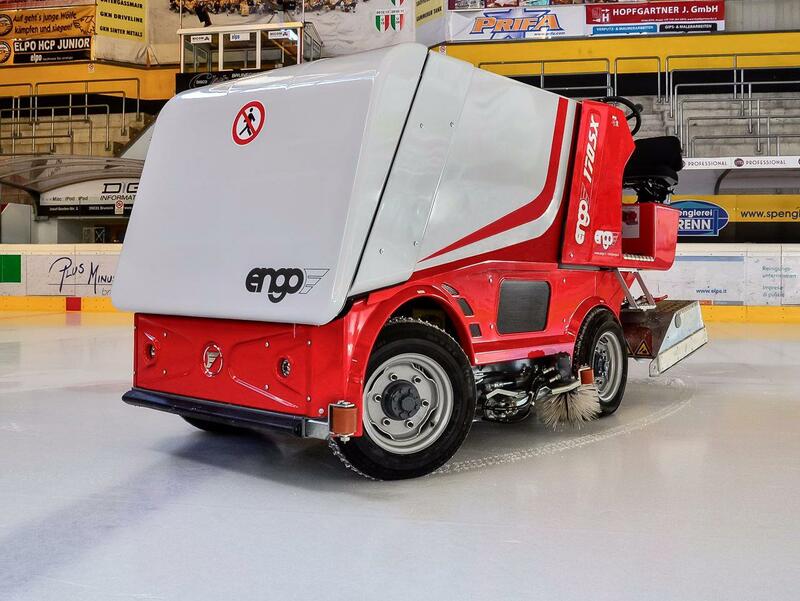 Engo Red Wolf "LX" is the only high-tech ice resurfacing machine that is worth considering for your standard ice field if you demand the highest quality ice for your customers. There is nothing better than this machine. MANUAL MAINTENANCE: On ice rinks of small sizes (less than 400 m2) the maintenance of the ice can be done manually, with two people in about 15 minutes. With special blades heavy and with great edge, the snow is collected, then it is removed from the surface of the track, and then simply watered with a thin layer of water, so as not to thicken the thickness of the ice. The maintenance staff is trained for these tasks, and they really do it quickly and efficiently. For these ice rinks, Very N'Ice provides all the necessary elements for the manual maintenance of the ice sheet.